I like saving money as much as the next person. Believe me any time when I see a two for one or half price sale; you can guarantee I will be all over it. Discounts and mark downs are always on my radar when I go shopping; I learnt from the best you know (aka my parents). There is just this one thing I can not get off my mind and that is this obsession with feeding your family for under a certain amount of dollars. Now I know it is just a promotional stunt but I cannot help feel we are being told a bit of lie here. With the Great GFC leaving many of us worried about money, I understand the rise in popularity of cost per serve labels. If you live in Australia, a major supermarket is promoting this as their main selling point to shop at their store. Through the use of magazines and popular celebrity chef apparently (I use the word lightly), you are can feed a group of four for under the price of good book. On paper it sounds passable just like those quick meal things which take forever to get right. I have more trouble cooking something from the packet than making it myself. Maybe I fail at following instructions. In reality, they take more from you than give. First all I do not think adding up the price per gram of ingredient used in recipe is right. You have to buy the whole thing when you are in supermarket, no one is going to only let you buy two tablespoon of tomato paste or 200ml of cream. This leads to another question. What do you do with the left over 50 ml or rest of bottle? Once again if you do not cook often or know how to use it, it will go to waste. Some of the ingredients they have used only have short shelf life too, so more again more waste. “Easy” recipe? I may use many different things and apply a lot of techniques in my formal baking, when I am cooking dinner my recipes are only 5 ingredients MAX long. Yes I have a stew that is made by only using 5 things. The thing I am most concerned about is the serving size is never enough. It might be ok for 3 girls or 4 small children but I know males are going to want to eat dinner too. Any one that has teenage boys or even a boyfriend would know this; one serve is never enough. Also who has ever disliked left overs? I love them. Anyway to this pita. I have never made these before as I rarely eaten them outside the restaurant. Store packaged ones are just nasty…; dry and brittle pieces of leather in my opinion. I never thought they were so easy. 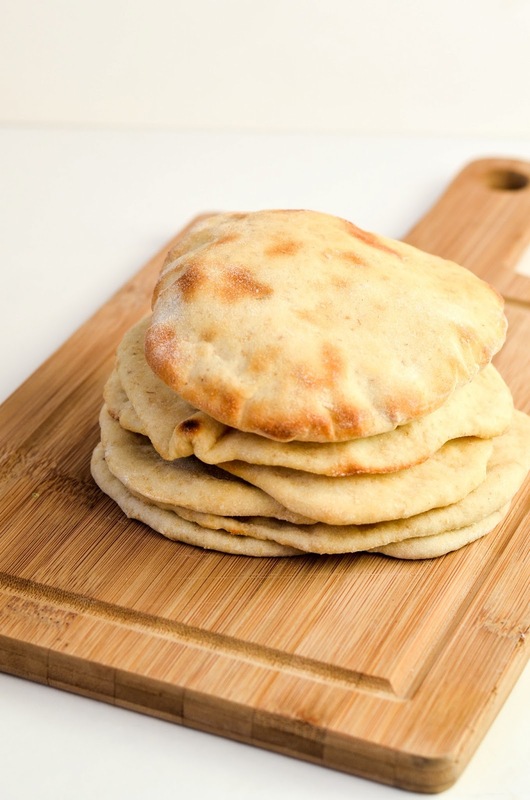 Inspired by a number of bloggers, I undertook my first pita a few week before. Results? An extremely happy baker. Since then I have made these every week; easy wraps and instant pizza bases. Everything a girl needs to make an instant lunch. 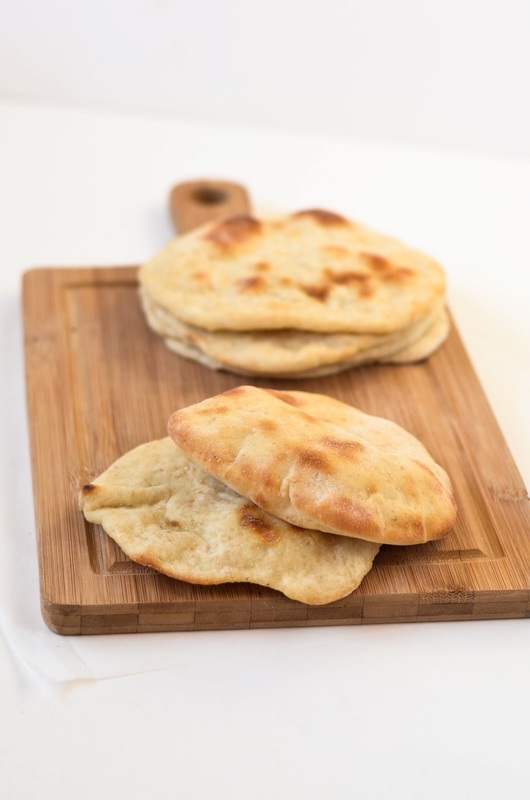 This time I changed it up and looked up a recipe for sourdough pita. I have been neglecting my pet for the past few weeks, so it definitely needed a good feeding. I used this one form a website I love. Joes pastry has always served me well and this time is no exception. While pita has a distinct chewiness about it compared to the ones made with dry yeast. Also I used half whole wheat here which definitely effects the texture. 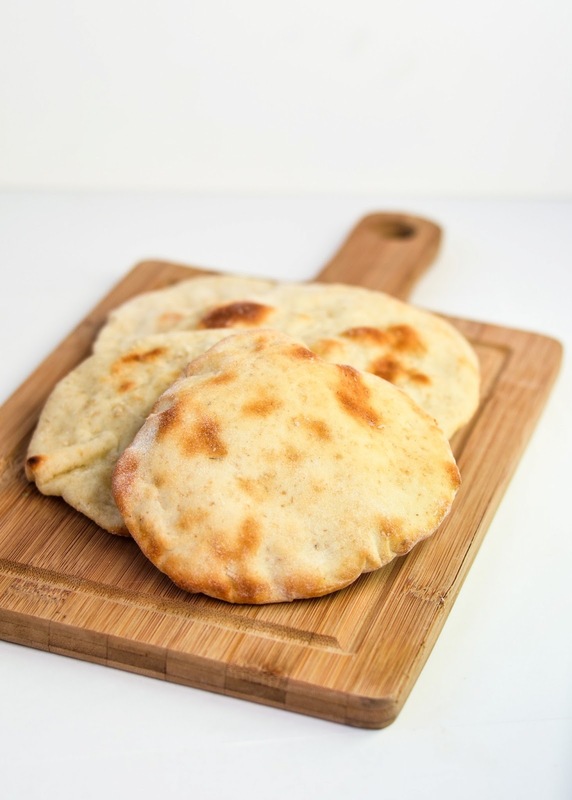 So if you need to refresh your sour dough pet make a batch of pita. You will not be disappointed. In a stand mixer, place all gradient in the bowl. With the dough hook, mix the ingredients on low for 2 minutes. After move the speed to medium and knead for a further 7 minutes. It should become smooth, silky dough. This one is slightly wetter but it is ok if you flour your bench more when rolling. Leave to double for 1 hour. Divide your sough in to 70g balls. Roll into a ball and let rest for 30 minutes. Roll out to circle and leave to rest for 10 minutes. 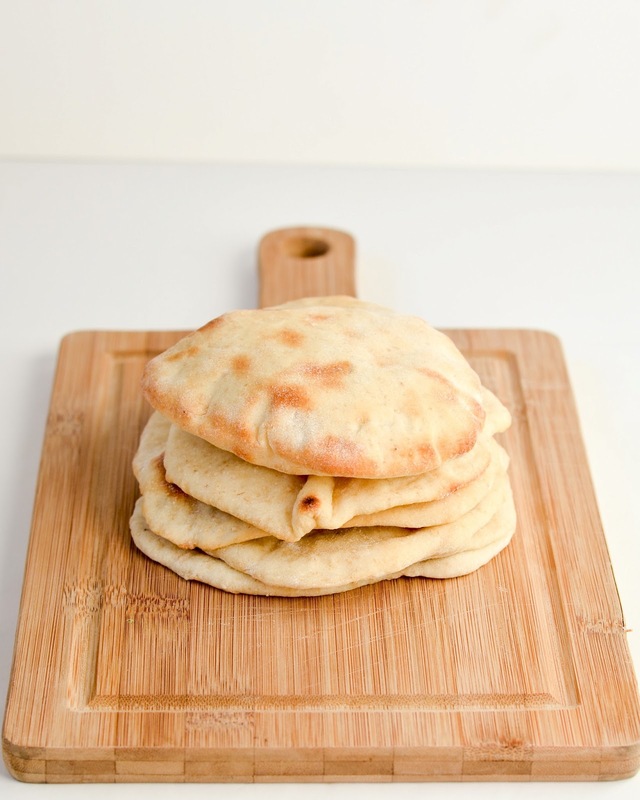 When they are slightly puffed, drop two pitas in to the pan. Bake for 3 minutes then turn. Bake for further 3 minutes and remove to plate. Repeat. Stuff them now or freeze for later. 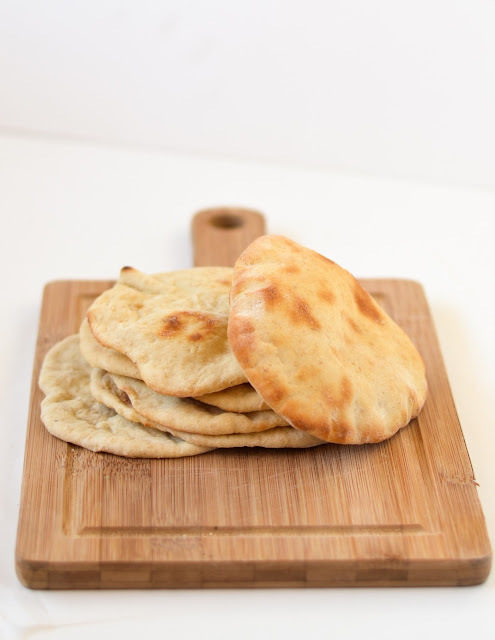 I just made pita chips and now I’m wishing that they had been from homemade pitas. Impressive! Thanks! Pita chips? They sound great, I will defs check it out if you have posted them. 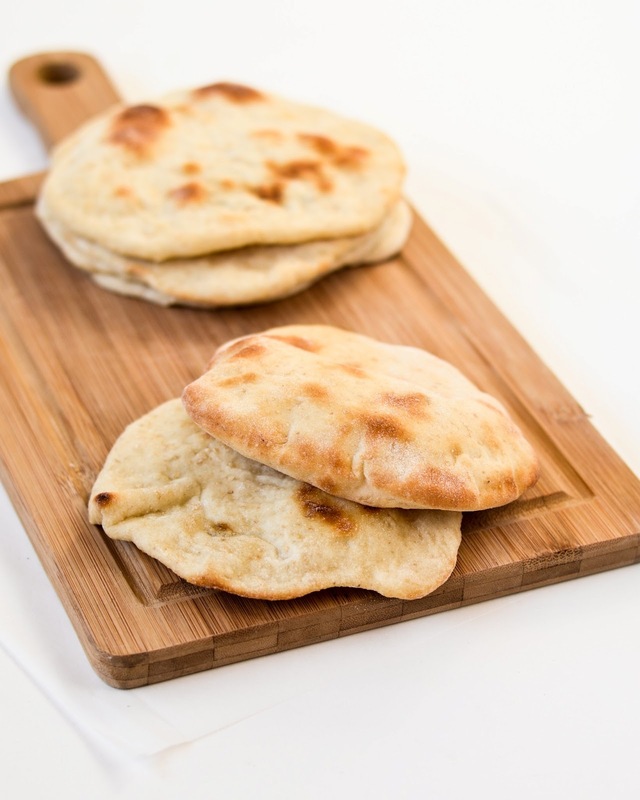 I’ve never made pita bread before, but this sounds amazing! I bet it’s way better than store bought! Thanks for linking up to What’s Cookin’ Wednesday! 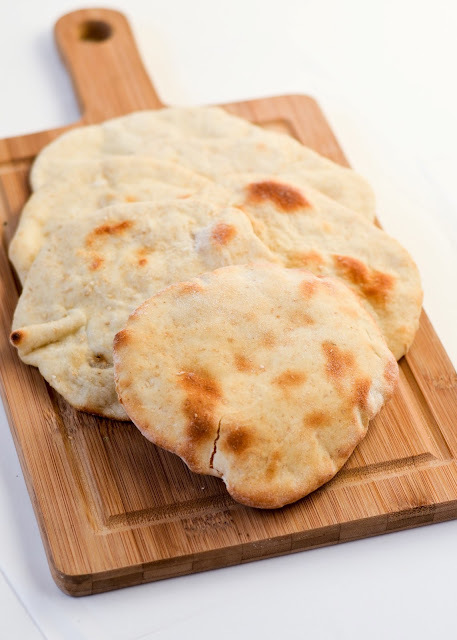 Beautiful, absolutely beautiful pita bread!!! My family love these and I always want to make them at home. I’m going to save this recipe. Thank you so much. Your photography is gorgeous! Thank Nami! My family is biggest influence on my cooking. My mum has developed a taste for Middle eastern delights right now, so I made these for her. I can express how delighted I am to hear you think my photos are good. I am still trying to get the hang of it and any kind of feed back is great. Make them! really! they are too easy for a cook like you! These look delicious! I like that you have used sourdough! Thanks, I though it be something different for the readers out there! This sounds like an awesome idea! I’m always looking for good ways to use my starter. Did you use fed starter for this recipe, or just the discard? well in Joe pastry recipe he recommends using a active starter if you want quicker ones. I used a unfed one and it worked out fine.Thank you for commenting. That makes sense… thanks so much!